US Haul part 1 – Big Lots! Over the holiday break I spent some time in the States, to do what I do best – shop! I was too afraid to face the Boxing Day crowds here in Toronto, so over the border I went. The malls were still quite busy, but not as hectic/terrifying as it has been in my experience, while working in a Toronto shopping mall on Boxing Day (Kudos to all you brave Boxing Day employees!). lately this store has been stepping it up, cosmetics-wise. 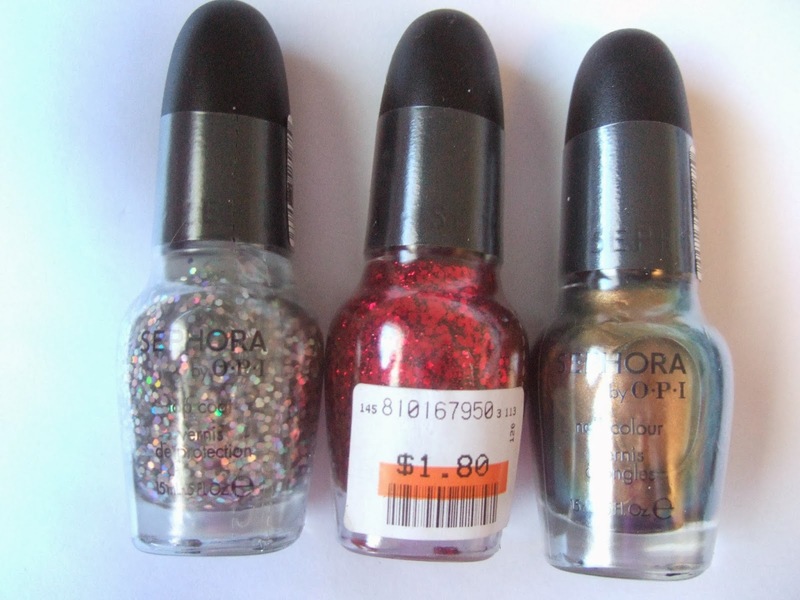 L-R: Sephora by O.P.I. in “Beam Me Up Hottie!”, “Be-Claus I Said So”, and “S-age is Just a Number”. L-R: “I Only Shop Vintage”, “I’m With Brad”, “Already Famous”, “Set the Mood”, and “Under My Trench Coat”. Originally priced at about $9.00 at Sephora, sold at Big Lots for $1.80? I’ll take 8 bottles, please! 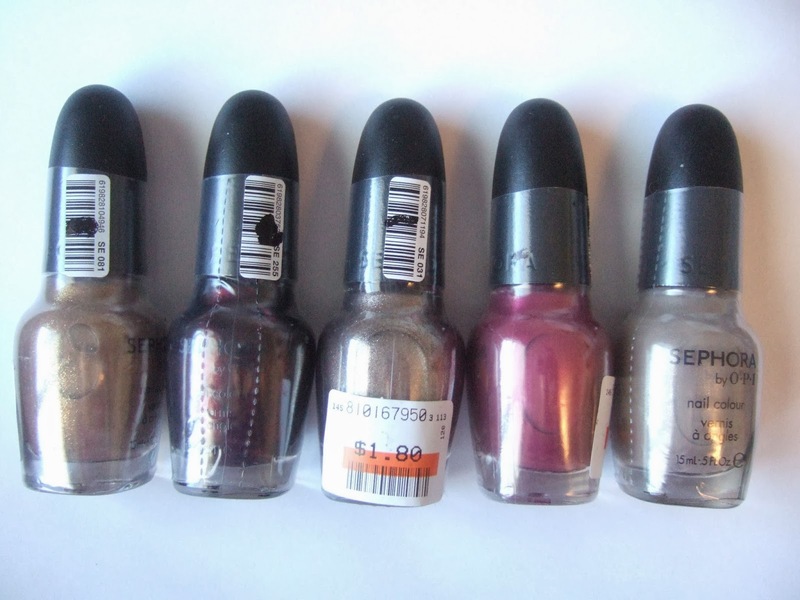 L-R: Maybelline Color Show nail polish in “Styled Out”, “Poolside”, “Midnight Swim”, and “Sandstorm”. 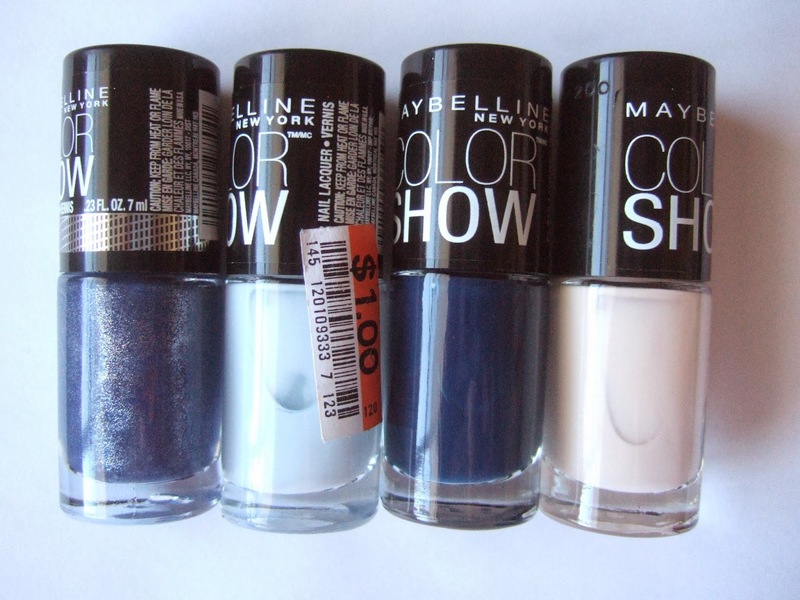 Big Lots carries a BUNCH of these bad boys, always for $1.00 – which is great if you want to try out a new color, but aren’t willing to commit to a full size bottle – Maybelline Color Show polishes are 7 mL, about half the size of a full-size polish, like Sally Hansen Complete Salon Manicure. L-R: Calcium Gel Nail Hardener, Gentle Cuticle Remover. 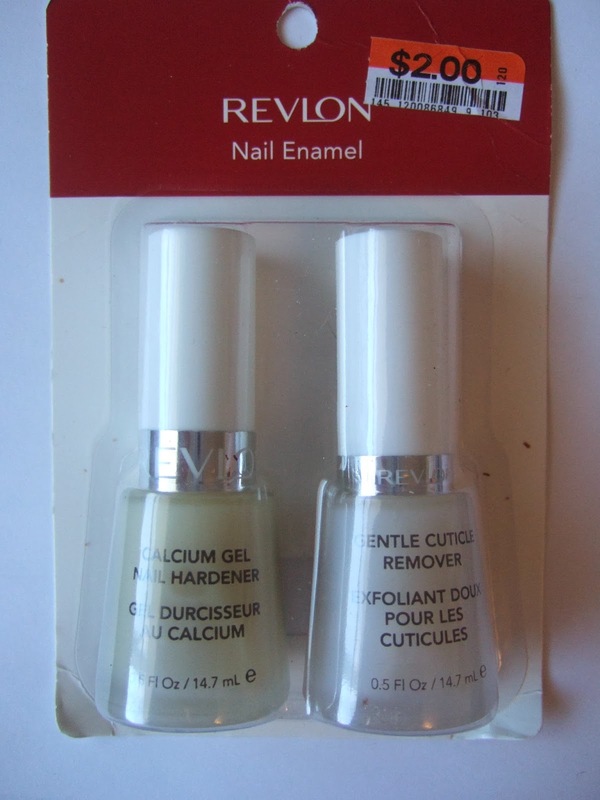 I just happened to recently make Revlon’s calcium gel hardener my go-to nail treatment, and it’s results have been great, so I couldn’t say no to snagging another bottle – the pair was $2.00. L-R: Maybelline Color Tattoo in “Precious Pearl”, “Shady Shores”, and L’Oreal Infallible in “Blinged and Brilliant’. Color Tattoos for a dollar?!?! Sign me up! 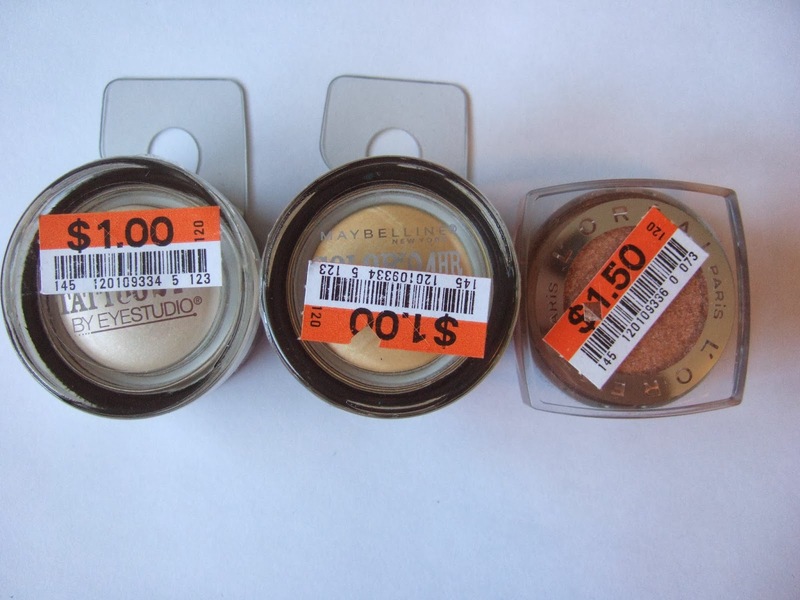 These were the only 2 the store had – and while digging, I found the Infallible eyeshadow for $1.50 – really happy with this deal. Now to figure out how to work these color tattoos into my once “powder-only” eyeshadow routine – suggestions, ladies??? L-R: e.l.f. 32-piece warm eyeshadow palette, and Revlon Diamond Lust in “Night Sky”. I got the elf 32-piece eyeshadow palette in warm, because it has mattes, satins, and shimmers in a variety of shades – is my search for the be-all and end-all, perfect taupe coloured eyeshadow over? 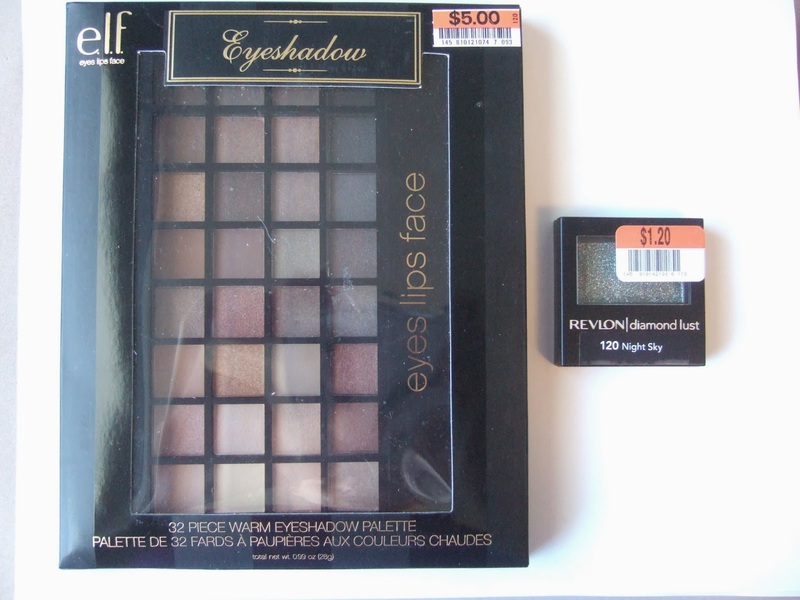 The palette was $5.00, plus 30% off, and the Revlon single was $1.20. That’s my Big Lots haul, stay tuned for the other goodies I bought on my trip! Comment below telling me what treasures you have found at your local Big Lots. Thanks Desire! This was a culmination of a couple trips to different locations, but it was totally worth it.